Valentine’s Day 2019 | Booking Up Fast! Share a #MoetMoment with your loved one this Valentine’s Day! February 14th is around the corner so book your Valentine’s Day lunch or dinner early to secure the best seats at Steves! 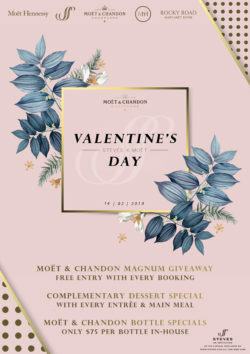 With every Valentine’s Day booking ~ you’ll go in the running to win a Moët & Chandon magnum!